A workshop on the Chorus of the Götterdämmerung by Wagner was conducted in 2011/2012. Luc Dewit is an Opera director working mainly alongside William Kentridge from South Africa. He has worked in La Scala, The Met and many others. He is at the moment working on The Ring by Wagner for La Scala with the Belgian director Guy Cassiers who has already directed Das Rheingold and The Walkyrie in 2010. Then follows Siegfried and Götterdämmerung in 2013. The second year is involved in the creation of The Ring by Wagner for a specific period. The work is a research, creation and discovery through acting the roles normally destined to the soloists: Hagen, Günther, Brünhilde, Gudrun, Siegfried. There is an exploration of the different ways of moving and interpreting the Chorus. They work with the decor of the future production and with Wagner’s music, seeking the acting and the rhythm given by the composer. The work follows the 2013 production’s preparatory phase. The performance at La Scala is with orchestra, soloists, and a 60-strong Chorus.. The second year students’ final performance is to the teachers of the school and the team working with Guy Cassiers. During this 2014 season, William Kentridge and Luc Dewitt, who have been close collaborators for a decade, came to work with the second year: two full weeks of creation. The work was an in depth research on a specific scene of the opera « Lulu » which they will be directing in the future. The scene, taken from the astonishing opera by Alban Berg, evokes a casino where the Stock Exchange plummets. 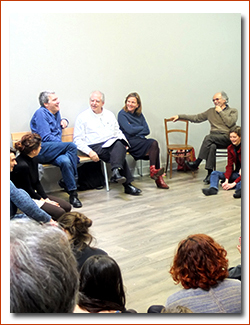 They worked on tableaux which come together and then separate and on which are grafted masks and drawings created by William Kentridge during the rehearsals at the Lassaad school. 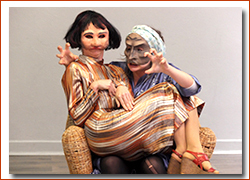 These tableaux, designed with the help of the actors, figure in the Opera Lulu which is already In rehearsal in Amsterdam. Then they will be going to New York, to The English National Opera, and Toronto. After intensive work with Lassaad and Norman Taylor on acting with the half masks created by the second year students, Luc de Wit came to lead special work on the text of King Ubu by Alfred Jarry. With the second year students, his aim was to find a new Ubu and begin to bring to the world a unique universe. Luc teaches at the school between his work as director. His latest are The Chorus in Götterdämmerung at the Berlin Opera and at La Scala, The Magic Flute at the Opera in Lyon and the reprise of The Nose at the Met in New York. In 2015 he is co-director of Lulu by Alban Berg, the premiere taking place in Amsterdam in June. 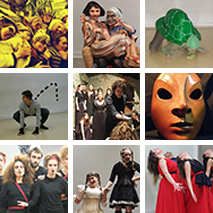 The second year students worked intensively for five days and then performed a 45 minute show on Michel de Ghelderode’s The Temptation of St Antony. 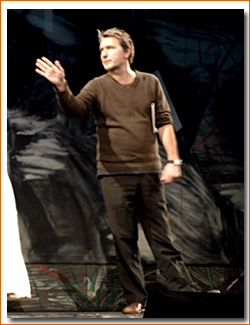 The acting and staging were directed by Luc de Wit who is a teacher at the school and an Opera director. The text was well adapted to the the work on bouffons which is a style deeply explored at the school. The students were allowed a freedom of interpretation which gave this short moment a timeless quality.